What results from that premise is a fast-pace romp zoomed in on a kid on a fixie, with track skids, curb jumps, skitching off taxi cabs, and general edge-of-seat urban riding drama being hallmarks of the show. The 91-minute “action/thriller” movie comes out in August. According to IMBD.com, while filming Joseph Gordon-Levitt rode his bike into a cab and smashed into the rear windshield, shattering it, and requiring 31 stitches on his arm. 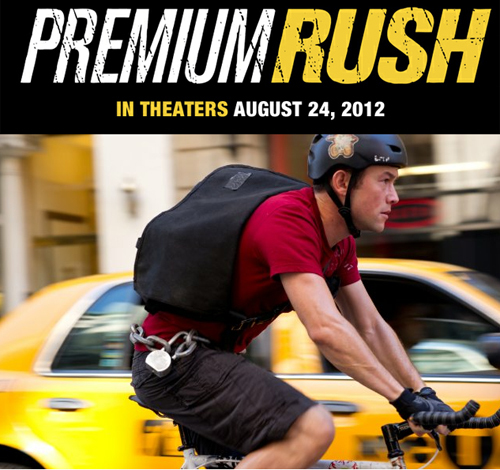 This film has not yet been rated, though for bike junkies the summer flic might be a must-see. —Stephen Regenold covered another urban/fixed-gear phenomenon last week in the article “Seriously, What’s Up with Fixed-Gear Freestyle?”.